← How to FAX a PDF? If you need to convert PDF document to image file, you can have a try of the application VeryPDF PDF to Image Converter which is able to convert PDF to BMP, JPG, GIF, TGA, WMF, TIF, etc. image format and make different settings for the created image just like setting image resolution. To learn more information about this application, welcome to visit the homepage of VeryPDF PDF to Image Converter. To evaluate the free trial version of the application, please free download VeryPDF PDF to Image Converter. After downloading the free trial version of this application, please install it on the computer and then launch it. With drag and drop operations, you can easily add PDF documents into the file list of the application. When selecting any of the added PDF, you can see the preview on the left preview panel of the application. If you need to remove the added PDF, please click Remove or Remove All button. Please see the interface of the application in following snapshot. Please see File type dropdown list in which there are all supported image formats. Please choose one that you need and then set the output location in Destination folder edit box or click Browse button to choose existed file path. In order to set the resolution of image in the conversion from PDF to image, please focus on PDF group box. 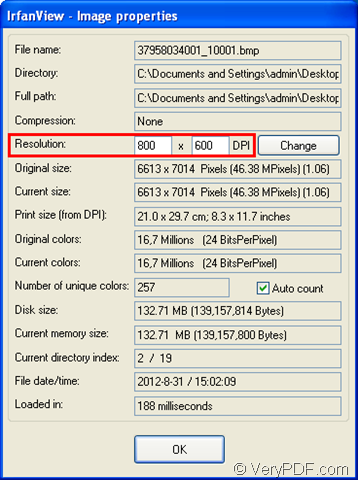 There are two spin boxes named as X Resolution and Y Resolution in which you can set resolution freely. At last, please click Convert button to make the conversion and wait for several seconds until the image is saved successfully in specified location. In following snapshot, you can see the properties of the created image. 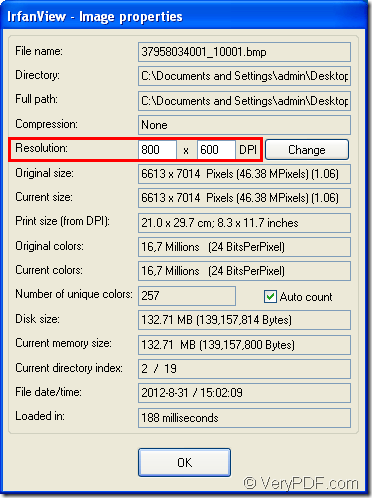 After the conversion from PDF document to image, the resolution has been set successfully. Now do you need the help of this application? If so, just click the following button to download the free trial version of VeryPDF PDF to Image Converter. Does PDF to Image Converter Command Line convert fillable PDF form fields to TIFF or JPG or PNG image files? 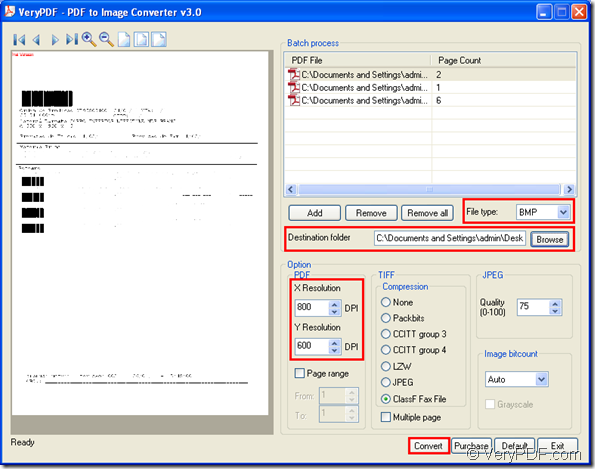 How to call pdf2imagecom.exe to convert from PDF files to image files from C++ source code? This entry was posted in PDF to Image Converter and tagged image resolution, PDF to image. Bookmark the permalink.